Far too often people try to take on major fitness goals all on their own. While ultimately your fitness will depend upon your own strength, determination, and grit, reaching fitness goals when you are part of a community is far more effective. At B.O.S.S. Fitness, we are extremely passionate about our unique fitness community. We believe that when you sign up with one of our personal trainers in Columbus, you will be more successful due to the community surrounding you. From the moment you enter our gym, you will feel the unique energy in the air. The way we greet one another, the way we spur each other on, it is all part of what makes B.O.S.S. Fitness such a unique place. 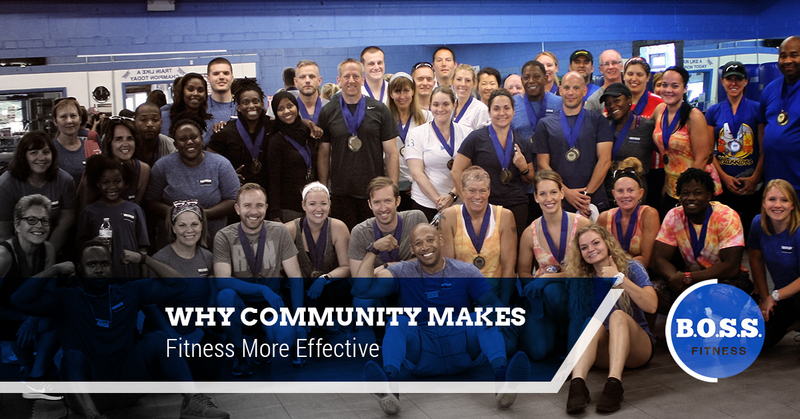 So why exactly does community make fitness more effective? Read on to find out how our fitness community can push you to new fitness heights. As humans, most of us need a helping hand sometimes. We need to be encouraged when we have fallen down. We need to be pushed to challenge ourselves more than we would have on our own. Being part of a fitness community means you are both encouraged and challenged. When you show up for a class and you start to hear that voice in your head telling you there is no way you can do one more rep, our community will be there to tell you otherwise. Your fellow community members will be there to remind you that you are stronger than you think you are, that you can keep on going, and that you will do one more rep.
Not only will your fellow community members provide you with encouraging words, they will also challenge you. They will spur you on to not give up too early. While your personal trainer is the starting point for this energy, the community will manifest this energy in a unique way. Not only will you find our fitness community is there to challenge and encourage you, they are also going to inspire you. The great thing about B.O.S.S Fitness is that we welcome people of all walks of life. Young, old, in shape, out of shape, it doesn’t matter at B.O.S.S. No matter who you are, you will find others around you who inspire you. You will watch as someone just like you succeeds and reaches fitness goals they never dreamed possible, and their enthusiasm and joy will be contagious. You will find yourself challenging yourself even more as you watch those around you succeed. Working out alone can become discouraging and you can look around most gyms and only see fit people who feel far out of your reach. At our studio, you will find people just like you. People working with all their might to become stronger, better, healthier, and when you see those people succeed, you will know you can succeed too. Not only will our community encourage, challenge, and inspire you, you might find yourself making personal connections with fellow members. When you connect with others in our fitness community, you’ll be more motivated to keep showing up for classes. We encourage our members to connect with one another and swap stories. You can moan together after a hard workout, but encourage each other to keep on working hard. Knowing your fitness community is far more inspiring than an isolated workout with no one there to spur you on. Ready to experience the B.O.S.S. community difference? Come check out our studio today and connect with a personal trainer in Columbus. We will help you create a fitness plan designed around your needs. Join our community and be inspired to become the healthiest you. META: Looking for natural ways to boost your energy? Go beyond the energy drink fad with these energy boosting tips from your local personal trainer. Who doesn’t need more energy in their day-to-day life? Most of us reach for an extra cup of coffee or a caffeine packed energy drink to get the pick-me-up we need. However, energy drinks and coffee are not actually the best way for you to boost your energy. Most of these energy boosters will lead to energy crashes. Instead, opt for natural ways to boost your energy and go beyond the energy drink fad. Bring your newfound energy to our gym and meet with a personal trainer in Columbus at B.O.S.S. Fitness to get yourself on the right track. It may seem counterintuitive when you feel an energy lag, but getting up off the couch and moving is actually the best way to boost your energy. If you can’t head to the gym, at least take a walk. Feeling an energy slump at work? Go outside and walk around the building a few times. Having a lethargic weekend and feel your energy is drained? Come join us in a fitness class. When you get up and start moving, you will actually boost your energy levels naturally. Did you know? Stress can cause you to feel exhausted and will zap your energy levels. If you have a lot of stress or anger in your life, you will become less and less energized. Stress can wind up leaving you incapable of handling even simple day-to-day tasks. Get rid of any stressors you can. For stressful components of your life that you cannot remove, find healthy ways of handling the stress. Make peace with things you cannot change, and focus on fixing what you can. Don’t let anger or stress rule your existence, instead, use them as fuel for your next intense workout. Going to the gym, taking a walk, meditating, these things can all help you overcome the daily stresses you cannot avoid. What you eat dictates a lot about your energy levels. Opt for whole grains and lower your sugar intake to avoid sugar crashes. Try swapping out your morning coffee for a green smoothie instead that incorporates kale, spinach, lemon, ginger, and apples, which are all known for their natural energy boosting capabilities. Head to your local nutrition store and purchase a B Vitamin supplement. B vitamins are an excellent way to naturally improve your energy levels and fight lethargy. Sometimes boosting your energy doesn’t need to be complex. Make sure you drink plenty of water every day. Dehydration can actually lead to energy loss. You may not even realize you are thirsty, but your body might be telling you it needs water when your energy levels dip. It might seem obvious, but when you don’t allow yourself adequate sleeping time, you will battle low energy levels all day. Nothing can replace a solid night of sleep. Make sure you listen to your body and determine the amount of sleep your body needs. For most adults, 7-9 hours of sleep is adequate. Remember, the better fitness levels you achieve the higher amounts of energy your body will naturally produce. Contact a personal trainer in Columbus today at B.O.S.S. Fitness and see how the B.O.S.S. hour can improve your energy.